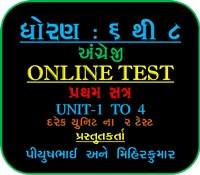 6 to 8th Class English Online MCQ Test Semester 1 | STD-8th Online Test Created by Piysh Patel & Mihirkumar solanki. This 8th Class English Online MCQ Test Semester 1 is very useful for teacher and students. This test open in all device like computer, Mobil, Tablet etc. Online Test is Very useful for Students. they gave this type test in his free time and also at home. student prepared for test and than he will be giving this test. Educational assessment is the systematic process of documenting and using empirical data on the knowledge, skill, attitudes, and beliefs to refine programs and improve student learning. Assessment data can be obtained from directly examining student work to assess the achievement of learning outcomes or can be based on data from which one can make inferences about learning. Assessment is often used interchangeably with test, but not limited to tests. Assessment can focus on the individual learner, the learning community (class, workshop, or other organized group of learners), a course, an academic program, the institution, or the educational system as a whole The word 'assessment' came into use in an educational context after the Second World War. As a continuous process, assessment establishes measurable and clear student learning outcomes for learning, provisioning a sufficient amount of learning opportunities to achieve these outcomes, implementing a systematic way of gathering, analyzing and interpreting evidence to determine how well student learning matches expectations, and using the collected information to inform improvement in student learning. The final purpose of assessment practices in education depends on the theoretical framework of the practitioners and researchers, their assumptions and beliefs about the nature of human mind, the origin of knowledge, and the process of learning. Electronic assessment, also known as e-assessment, online assessment, computer assisted/mediated assessment and computer-based assessment, is the use of information technology in various forms of assessment such as educational assessment, health assessment, psychiatric assessment, and psychological assessment. This may utilize an online computer connected to a network. This definition embraces a wide range of student activity ranging from the use of a word processor to on-screen testing. Specific types of e-assessment include multiple choice, online/electronic submission, computerized adaptive testing and computerized classification testing. Different types of online assessments contain elements of one or more of the following components, depending on the assessment's purpose: formative, diagnostic, or summative. 80–82 Instant and detailed feedback may (or may not) be enabled. In education assessment, large-scale examining bodies find the journey from traditional paper-based exam assessment to fully electronic assessment a long one. Practical considerations such as having the necessary IT hardware to enable large numbers of student to sit an electronic examination at the same time, as well as the need to ensure a stringent level of security (for example, see: Academic dishonesty) are among the concerns that need to resolved to accomplish this transition. e-marking is one way that many exam assessment and awarding bodies, such as Cambridge International Examinations, are utilizing innovations in technology to expedite the marking of examinations (see: Electronic marking). In some cases, e-marking can be combined with electronic examinations, whilst in other cases students will still handwrite their exams with papers scanned in securely and uploaded into an e-marking system. If you Like this Article to comment on below comment box and share it in your groups. Also Search in Google www.jobsGujarat.in .